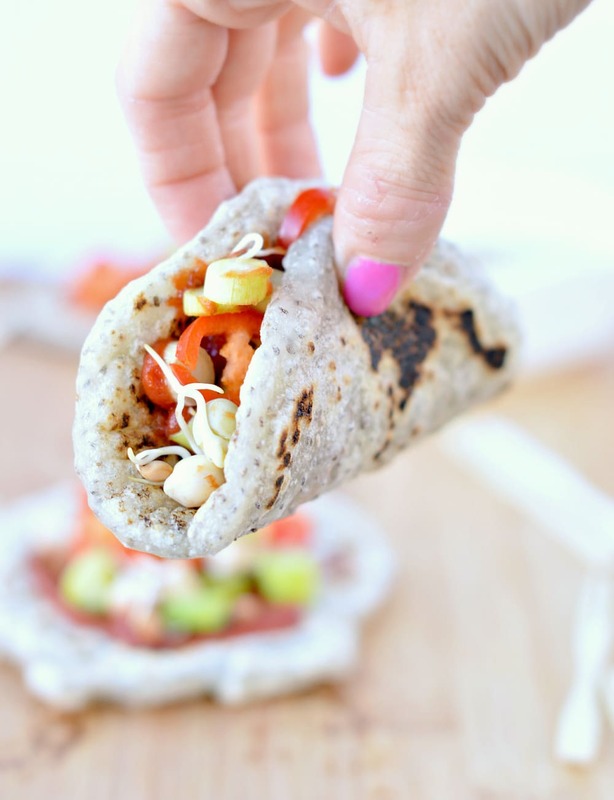 Paleo tortillas | A soft, chewy & healthy tortilla that won’t crack! I created this recipe for a dinner last night where I invited two friends that follow different diet. One is eating vegan and the other one is following the paleo diet. So I did some research on the web about what vegan people can eat and what paleo people can eat. 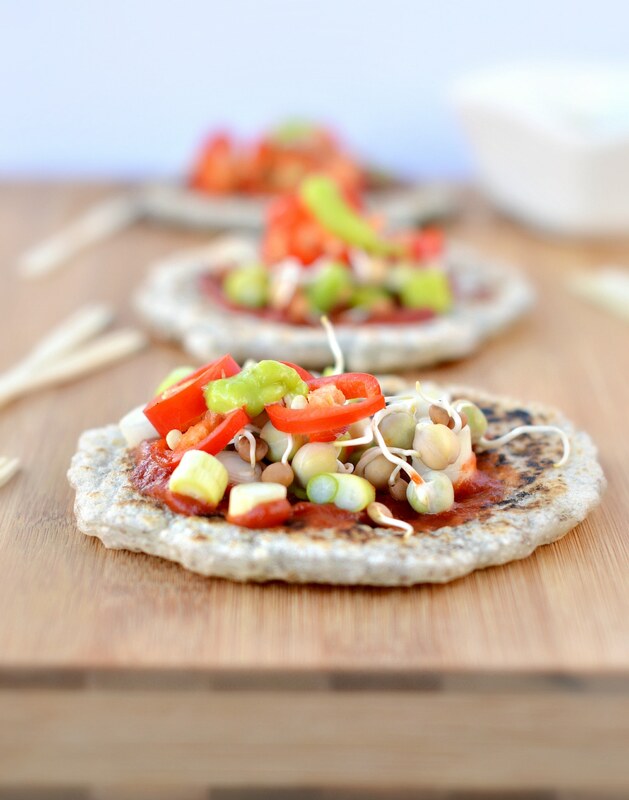 I finally came up with this paleo tortillas recipe which tick all the diet boxes. Well, the recipe is using tapioca flour which is sometimes on the grey zone for strict paleo diet followers but my friend was ok with it. The most important was they love them! Everyone topped their tortilla with toppings of their choice. My vegan friend choose to add lots of sprouted vegetables, spring onion, chilli and cashew aoili. I agree it is a spicy combo but it was very fresh and crispy which balance very well the chewy texture of those paleo tortilla. Myself and my paleo friends added some grilled chicken too. The benefits of chia seeds are way too long to be listed on this post but I simply love them because they contains few calories, add lots of nutrients and fibre to my food. It is also a wonderful egg free replacement in baking recipe. Simply switch 1 egg by 1 tablespoon of chia seeds dissolve in 3 tablespoon of water. If you want to know more about chia seeds nutritional info and benefit of chia simply check this nutrition website. The only inconvenient about chia seeds is the price. I love to buy chia seed in bulk as it is much cheaper and it store really well in a glass jar for almost a year! I add them a bit everywhere on my porridge, pizza or even salads. 3 tablespoon Organic Coconut Flour 3 lb. In a small mixing bowl place the black chia seeds and water. Give a good stir and set aside until a jelly-like mixture forms. 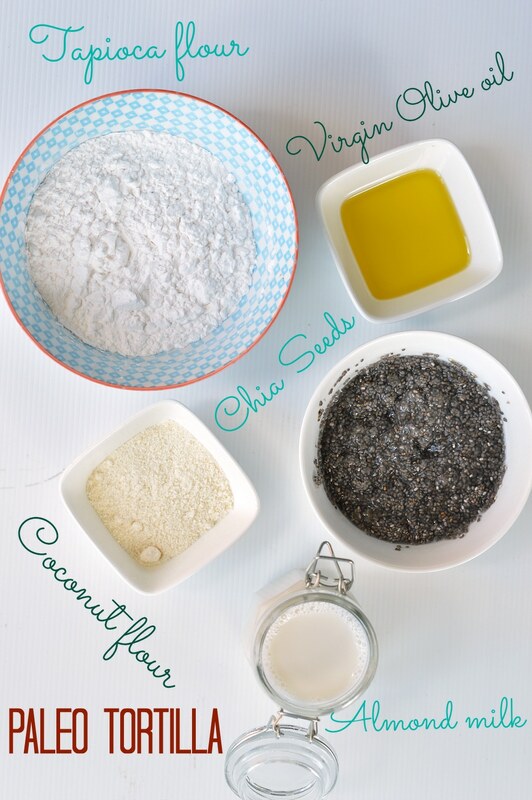 In a stand mixer or food processor (or mixing bowl) place the flour and combine in the black chia seeds and almond milk mixture. Combine until it forms a consistent batter, liquid but thick. Warm a Nonstick Round Pancake pan on high heat. Not medium heat ! Slightly grease with olive oil. I used a piece of absorbent paper dipped in olive oil that I rubbed onto the warm pan before adding the tortilla mixture..
Spoon about 1/4 cup of the batter in the middle of the pan to form a 8 cm tortiilla. Use a spatula to press the batter slightly and spread in over to form the circle. Be careful, tapioca flour is very chewy so press the batter gently as the part that is already in contact with the warm pan will harden quickly and if you move it will make a big mess! Cook on one side for 2-3 minutes. then flip over using a spatula and cook for 2 more minutes on the other side. Repeat those step one more time.The tortilla has be cooked two times for 2-3 minutes on both side to get a lovely colour. Wrap the tortilla into the towel to keep them warm and moist. They tend to be sticky so it is better to eat straight away. Enjoy with filling of your choice. This recipe makes about 8 tortillas. Hi Aj, You are right tapioca flour is high in carbs and I will not eat much of it while being on a no sugar/candida diet. The best options for you are low carbs flour or high fibre flour like almond meal, oat flour, coconut flour. I am not sure what will works in this recipe instead of tapioca flour as I did not try anything else yet so I will probably not recommend any substitute before trying. However, if you are craving on taco/tortilla I will probably recommend you another recipe from the blog like the carrot taco shell made with grated cheese, carrots and oat flour. Oat flour is high in fibre and lower in carbs than any wheat flour or tapioca flour and this recipe use a tiny bit. If carrots are too high in sugar swap for grated zucchini and make sure you drained them well before using in the recipe. 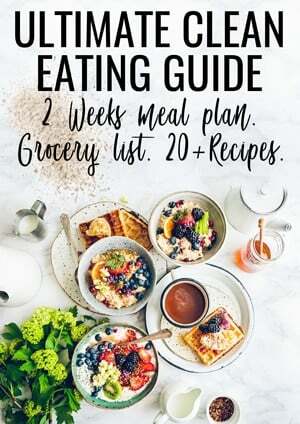 I hope it helps you cook something delicious that suit your diet 🙂 I have been on the candida diet a while ago and I know how difficult it could be to find recipes that are good for your body but it worth doing it! Usually anything grain free is pretty safe. I have a good list of my top 15 grain free recipes here including breads and waffles that I was eating while on candida diet. You can have a look and see what you could love to cook from there 🙂 Enjoy! See you around soon ! Carine. I’m looking forward to trying these! Just one little comment – while interchangeable in many recipes, tapioca flour/starch and arrowroot flour actually aren’t the same thing and come from different sources. Just wanted to mention that. Hi Tamara, Thanks for your addition! I did not know it was different. It this recipe I used tapioca flour. I hope you enjoy this recipe. Merry Christmas! Hey! I’m so excited to finely find a vegan/paleo tortillas!!! I have a question! How are the inside of the tortillas suppose to be like? I made your recipe today and wasn’t sure if I had made them right. Thank you so much for your help!! Hi Christianna, I made those for a couple of friends who are vegan and paleo, a real challenge but they love them. 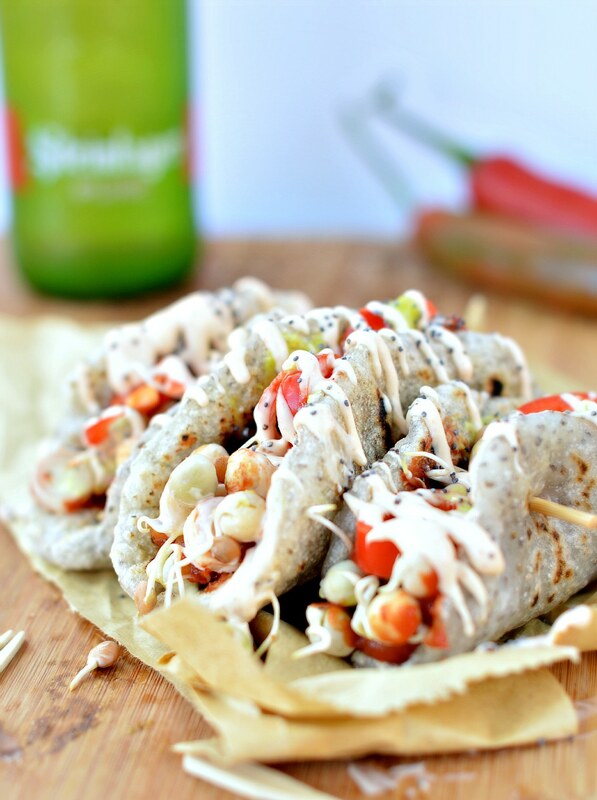 The texture was very chewy with crispy chia seeds all over the tortillas. It hold well together and won’t crack when filled. I found the cooking step a bit messy as tapioca flour do not spread well on the pan. It is a very elastic flour and the best way to cook them is to use a spatula to press the batter slightly and spread in over to form the round tortillas. I hope you enjoy them too ! Carine. Hi, although chia seeds have so many health benefits, they drive me bonkers by getting stuck in my teeth. How many eggs could I sub for the seeds? Hi Jane, I love chia seeds too and i understand your concern. I usually sub 1 egg for 1 tablespoon of soaked chia seeds. I never tried this recipe with eggs and it may change completely the texture, removing the chewy texture. I am keen to know how it goes with eggs. Let me know if it works! Enjoy! Carine. How well do these keep? Can I freeze them? Hi Sarah, I never freeze them but I am sure it works well as any tortillas. But they are so good that we always eat the whole batch at once! Enjoy the recipe. xoxo Carine.